A bit scary going through passport control this morning. Had to wait a fair while as the Russians don't like too many coming off the ship at once and they are very slow with checking everyone's papers. This is also the only port where we have to go through this process! 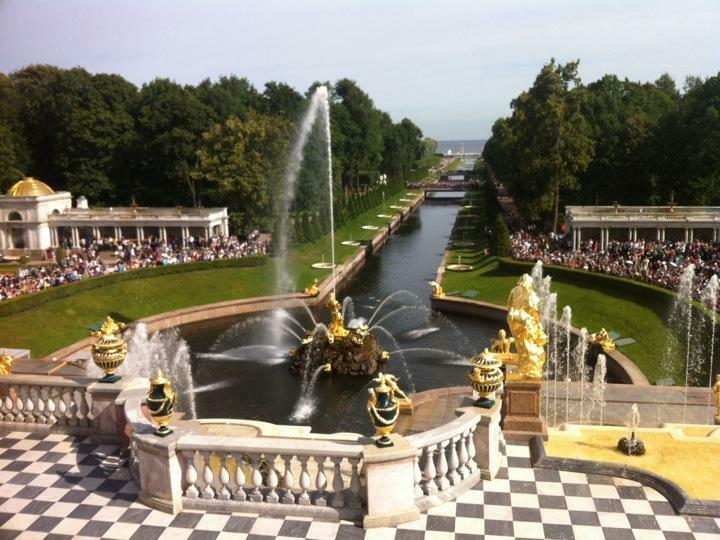 We drove to Peterhof (summer palace of Peter the Great and modelled on Palace of Versailles) - 1 hr away. View from palace extends down to the sea as Peter wanted to look over all the ships coming in. The gardens were set with many fountains which are activated at 11 each day and timed to music. The crowd was massive and the car park jammed full of buses with nowhere to move so we had to wait our turn to get out. Never seen anything like it before! We then had a typical Russian meal of beetroot soup and beef stroganoff, served with champagne and vodka shots. Nobody else wanted theirs so I ended up having 4! The afternoon was spent going through St Isaac's Cathedral (decorated in catholic style) and Yusupov Palace (where Rasputin was assassinated in mysterious circumstances). Cathy and I spent the evening at the Russian ballet where we saw Giselle. The theatre was very run-down though and we were so tired we kept nodding off in the first act. The second act was much better as there was more dancing in it.